Found 4 file extension associations related to DreamPlan Home Design Software and 4 file formats developed specifically for use with DreamPlan Home Design Software. DreamPlan Home Design Software is used to visualize and plan user's dream home with a realistic 3D design model. It allows users to create the floor plan of your house, condo or apartment, custom set colors, textures, furniture, decorations and more, plan out exterior landscaping and garden spaces etc. Visualize and plan your dream home with a realistic 3D design model. 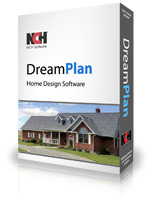 If you need more information please contact the developers of DreamPlan Home Design Software (NCH Software Pty Ltd), or check out their product website.